Though this may only be the beginning of the Oscar movie season, it arrives in great form and with one of the best films I've seen this year. You can take that one of two ways. 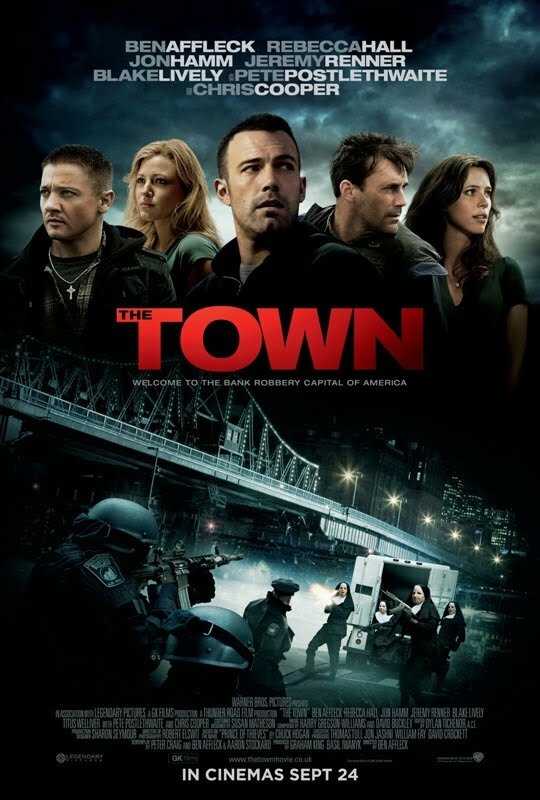 True, it hasn't been a stellar year so far with only three films or so coming to mind as good enough to make a top 10 list or you can take it as it is and trust that 'The Town' is a superb piece of filmmaking. When Affleck's directorial debut garnered such positive praise I, like many others, was rather surprised. With his second though, Mr. Affleck proves he was not just a one hit wonder but a true artist and one who is very good at his craft. From the opening sequence the tone is set, the neutral color palette and the performance driven drama is all exemplified greatly within the first few minutes. At the head of these strong performances is Affleck himself. Managing several different duties can sometimes be evident in one's work, but here the director/writer/actor is as flawless as can be. As a kid who grew up in Charlestown and was given no choice but to eventually turn to a life of robbery fuels Affleck's Doug with the need to see what it's like outside of this hell on earth he feels hes been surrounded by. As his complete opposite is Jeremy Renner's Jim. Renner, hot off the tails of last years Oscar darling 'The Hurt Locker' plays Doug's best friend as a loose canon willing to do whatever it takes to get the job done. He will gladly kill anyone who gets in his way, he hopes someone will make that mistake. These two create a theory of acceptance, as if this is what they are supposed to be doing and there is no other way to live their lives. That is, until Doug begins to court a hostage that was taken in a previous bank robbery. This creates much of the tension that ensues between bank heists but Affleck never lets it overpower the main story that is being told. The one about the city and its people and their way of life. As beautiful and charming as Rebecca Hall is here and as convincingly intimidating as John Hamm is able to come across, it is all just icing on the cake. The film never drags, its pace is a constant lead in to the next scene that only builds upon the previous one and amps up the stakes a little higher. Even when the camera lingers for a while on characters in lengthy conversations they are full of tense moments and include more meaning than what is being said on the surface. There set-ups for each robbery are quick but well planned, yet they are only doing what they know to do, what they have seen their fathers do before them. The movie is an interesting character and social study at its core. This mixed with genuine drama and fist-clenching tension makes for one of the better heist films in years past and as I mentioned, one of the better films all-around of this year. Good job Ben, can't wait to see what you have next up your sleeve.